With the spikes in the prices for silver and gold, several guests brought jewelry, gold and coins to sell. After all, Morgan silver dollars, provided they are not slick, contain 0.7734 troy ounces of pure silver. Lesser grade silver dollars from the early years can be worth more as pure silver than as a dollar. One dealer commented, "It sure is easy to sell gold." People continue to come to the show looking for gold and silver bullion. Dealers offered a lot of early US gold such as $20 St. Gaudens, $20 Liberty, $5 Liberty and $10 Indian gold coins. Then there were these $50 gold coins containing one ounce of gold as well. Both the obverse and reverse designs are based on sculptor James Earle Fraser's nickel that circulated from 1913 to 1938 known as the Indian Head or Buffalo nickel. 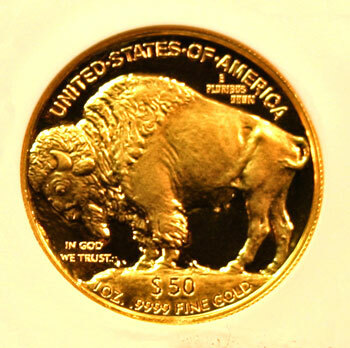 Per the US Mint, they sold 246,267 of the one ounce Gold American Buffalo coins. The price varied throughout the sales period, but the Mint estimates the price, on average, was $800 per coin. Just think, last week, gold peaked at over $1420 per ounce. This week, gold has pulled back, but it's still much higher than that initial $800 rate. Plus, this coin, graded as a Proof 70 Cameo by NGC, could be more valuable than the pure gold to the right buyer especially since its the first year of issue. Regardless, the coin is very handsome and would make a beautiful addition to a collection or to an investment portfolio. Putting coins aside for a moment, here's a BIG thank you to our dealers and to our guests for making this month's show a busy, fun and jam-packed day. We hope you enjoyed browsing, buying, selling and trading among the variety of numismatics and silver and gold bullion on the bourse. Mark your calendars for our next show on Sunday, December 12, 2010. The early morning was cool yet warm for this time of year with the day's temperatures reaching into the mid-60s. Overcast skies allowed thin sunlight to shine a few times, but in the afternoon and early evening hours, they brought rain. Even with the lack of sunlight, people driving to the show enjoyed the fall colors. Though some trees have lost almost all of their leaves, still others brightened the day with their bold reds, bright oranges and almost-hurt-your-eyes yellows. For some reason, a couple of our regular dealers expected this show to be less active than our recent shows which have been so busy. They were wrong. The show was packed with a full parking lot in the early afternoon. We even had a few out of town dealers come to the show to see what their friends on the bourse had to offer in their areas of interest. In some cases, the out-of-towners brought some pieces to offer for sale to the bourse's dealers. 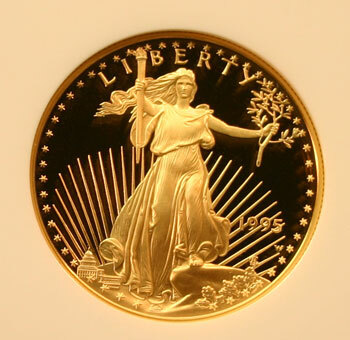 First, there's the American Gold Eagle with the modified design by Augustus St. Gaudens on the obverse. The reverse design by Miley Busiek shows a family of eagles. This gold eagle happens to be a Numismatic Guaranty Corporation (NGC) Proof 69 Ultra Cameo. Isn't it beautiful? 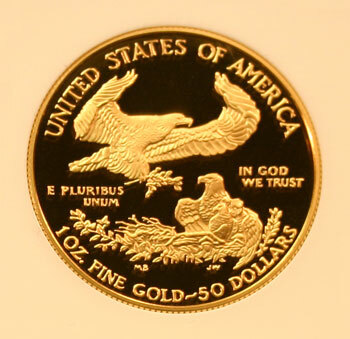 The American Gold Eagle is beautiful and contains a troy ounce of pure gold, but it also includes roughly 3% silver and 5% copper in its composition. 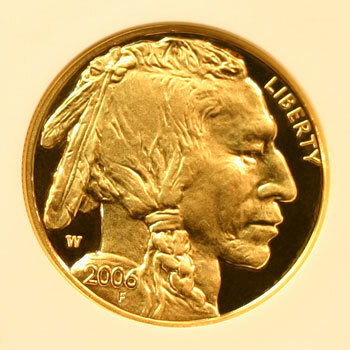 In 2006, the US Mint introduced another gold coin, the American Buffalo, that is 0.9999 pure gold. The coin below comes from the Mint's first year of making a 24-karat gold coin.